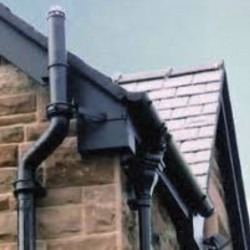 Hargreaves Premier Half Round Cast Iron Gutter is manufactured using traditional methods to BS 460. Available in a choice of four sizes - 100mm, 115mm, 125mm and 150mm. Half Round Cast Iron can be ordered in either factory finished gloss black or in a grey transit primer to give protection on site prior to being painted in a colour of your choice. 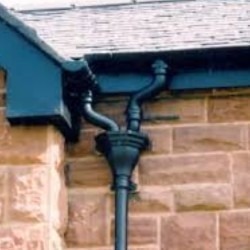 Cast Iron Half Round Gutter is about as traditional as buildng materials can get in the UK. 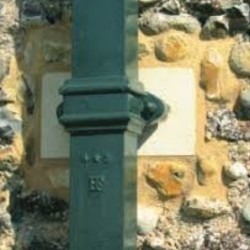 Used since victorian times, this type of gutter represents a timeless style that has endured for over a hundred years throughout all kinds of developments in building technology. Strong, durable and totally recyclable, Cast Iron is stll a widely used material in all types of applications in the UK building industry and in partcular in plumbing, heating and drainage projects. Much favoured on listed buildings, schools and churches, cast iron gutters are still a very popular choice for public and private buildings alike.